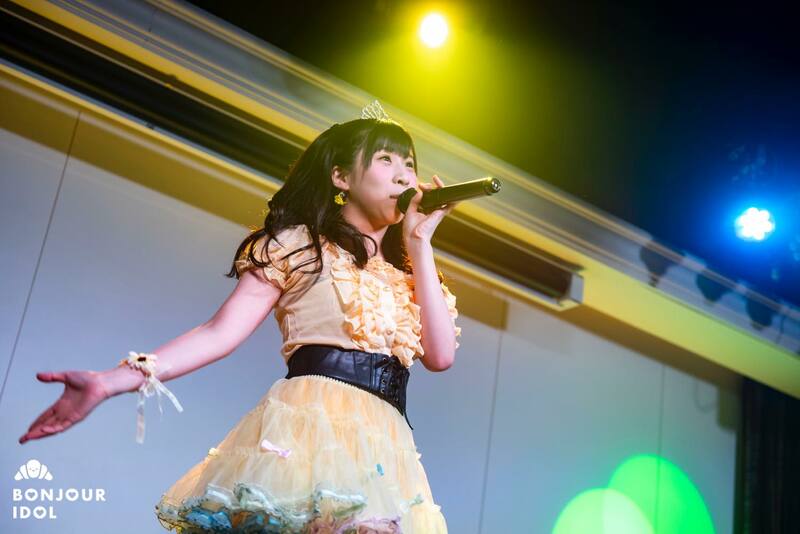 Iketeru Hearts‘ fans were reunited in Shinagawa on the May 31st to celebrate Ochi Karin’s birthday. Crowd and fans had prepared yellow banners and garlands, Karin’s official color in the group. After a few minutes, the room went dark, giving life to an ocean of yellow glowsticks, and the members appeared on stage. All of them were wearing customized yellow t-shirts and the skirts from their 2017 tour costumes. Ochi Karin, however, was wearing a princess-like dress and a shiny tiara. They opened the concert with singles “Lumica Jane” and “Rosetta Stone” then took a break for a MC in which they introduced themselves. Karin’s long-awaited solo corner finally started, with a cover of “Connect”, originally by famous duet ClariS. All the other members gathered on the side of the stage to support the queen of the night, which triggered amused laughter in the audience, amidst the fiery calls. Wota calls went crazy when the first notes of ex-AKB48 Watanabe Mayu’s first single “Synchro Tokimeki” started. Karin was shining bright like a true princess on her birthday. After thanking the audience, Karin performed the theme song of Iketeru Heart’ latest tour, “LOVE♡LOVE♡LOVE”. At this point, all the members joined Karin on stage and her birthday celebration reached its climax when AKB48’s “Namida Surpise” started. Aise Risako, who secretly sneaked backstage, came back with a huge flower bouquet for Karin. Between bliss and laughter from the audience, Yukafin, former Afilia Saga member and Iketeru Hearts’ producer, showed up on stage with a birthday cake and an album full of messages from the fans. Karin, who now turned 20 years old and therefore became an adult in Japan, shortly retraced her journey from her audition for Stand Up! Records a few years back, then expressed all the love she has for her group. She also allowed herself to speak about several goals that she would like to fulfill in the future, such as performing on the main stage of now famous Tokyo Idol Festival. “Dreaming Love”, “Karma Stripe” and “Kibou no Chizu” closed the main part of this birthday celebration. Without a break, the girls followed up with an intense encore, after the fans replaced the traditional “enkoru” call by “Ochi”, Karin’s family name. “Happy End” beautifully ended the concert. Ochi Karin, overwhelmed by this wonderful night, greeted everyone and thanked the fans for one last time before disappearing backstage. The next birthday to celebrate will be Iketeru Hearts’ leader Nijika‘s on June, 9.